I tend to think that music is the most evocative out of all the arts. Hearing a snippet of a piece - even just a few seconds - can be enough to drag up decades-old memories and transport you back to another time and place. Often, we aren't even aware of these subconscious associations until they bubble to the surface. Case in point: when I was very young, I used to watch and rewatch a Disney Halloween special that my parents taped for me from TV. A Disney Halloween was, like many children's programs, a bizarre concept. It took popular songs like "Thriller" and "Bad Moon Rising" and played them over spooky clips from old Disney cartoons. 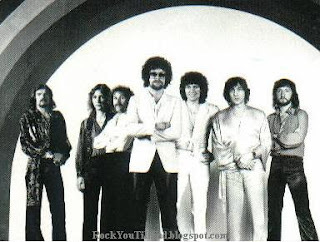 One such track was the Electric Light Orchestra's "Evil Woman", played over images of the various wicked females that have graced Disney's films over the years. Listening to ELO this week, "Evil Woman" came on and I was immediately transported back to 1990, with my four year old self huddled in front of the television watching cartoons. I hadn't thought about that Halloween special in years. It's a very unnerving thing to have a less than exciting memory from twenty years in the past suddenly come rushing back to me, all because of a somewhat arbitrary association with a random ELO song. The above example is stranger than most, but this sort of thing happens to all of us, all the time. A few measures from a song will bring back forgotten memories of a particular time of year, of a person, of a feeling or emotion felt at a very specific moment. As of today, February 22nd, 2010, I have been doing this "artist a week" project for exactly one year. Looking back over the list of artists to which I've been exposed in the past 365 days, it's amazing how much I can remember about each specific week. Week 12, R.E.M. week, it rained. Week 33, the week of The Allman Brothers Band, was the first time it felt like autumn. The last day of my previous job was to the soundtrack of Radiohead; I put together furniture in my new apartment to Fleetwood Mac. I locked my keys in my car that week I listened to the White Stripes; I flew home for Thanksgiving to Queens of the Stone Age, but the soundtrack to Christmas and New Years was the Rolling Stones. The strange thing about music is how intangible it really is. It doesn't quite exist as notes on a page, or as data in a recording. Music necessitates a listener, and that listener will always bring something personal to the experience. Different kinds of music affect us in different ways, partially because of deviations in taste, but partially because we all bring different associations and memories to the table when listening. These associations can be significant, like rediscovering a song that helped you through a hard time, or mundane, like my experience with "Evil Woman". But they're always there, affecting our listening experience in ways we don't fully comprehend. I'm sure there's some psychological explanation that could help illuminate this phenomenon, but part of me would rather not know how this works. Instead, I'll be content to put on The Stone Roses, just like I did one year ago, and be transported back to 2009. I live in Florida now where it's a balmy 70 degrees out, but with the help of this soundtrack, it's not so hard to member that chilly February morning in Washington D.C.
WHAT I KNEW BEFORE: "Evil Woman" aside, the only other ELO track I was familiar with was "Fire on High", which came on the radio once and I thought was totally awesome and immediately added to my iTunes library. MY LISTENING: I listened to Out of the Blue (1977) every day this week. I also put on A New World Record (1976) three times, and El Dorado (1974) and Face the Music (1975) once each. WHAT I LIKED: This music is ridiculous. ELO is akin to sticking Elton John, Leonard Bernstein, the Bee Gees and Meat Loaf into a blender, then going on a three-day drunken blender with the results. I don't even know what's going on in their music most of the time. There's vocoders! Sound effects! Disco! Mournfully melodic piano lines contrasted with danceable synth music! In "Birmingham Blues", the band goes so far as to quote Gershwin's "Rhapsody in Blue". Their schtick, as evinced from their name, is the combination of classical string instruments with rock music. Jeff Lynne (the creative force and only real permanent member of the band) isn't always able to blend the two, but when it works - and it works with more and more frequency as their discography progresses - it makes for a hell of a catchy song. Sure, the music amounts to stringing a bunch of riffs together and then overdubbing it all to hell with a ridiculous amount of backing tracks, but it's so catchy and energetic that you can't help but love it. Performers of the stadium rock generation, ELO assumes a melodramatic flair for theatrics and camp. This is fine by me. Songs like "Steppin' Out" or "Sweet is the Night" aim for emotional catharsis the likes of which haven't been seen since Wagnerian opera, while other tracks, like "Jungle" or "Summer and Lightning", blend sound effects with danceable riffs to create some good old-fashioned party music. I really don't know how to explain it. But ELO is such a bizarre blend of symphonies, choirs, rock groups, synthesizers and sound effects that they're worth a listen. And if the songs rely on sheer bloated brute force rather than subtlety and finesse, isn't that the point? For one thing, I don't think the group has any real talent besides Lynne's ability to write a song that incorporates all the aforementioned disparate elements. When the tracks are bare or trying to actually be restrained, like "Strange Magic", the music just sort of falls flat for me. That, and I just can't take this music seriously, which is both a plus and a minus in my book. It's great catchy stuff to listen to while getting work done (putting on Out of the Blue while grading papers made me so giddy that I had to restrain myself from falling prey to grade inflation), but in the end it's all style and no substance. It's cotton candy - colorful and gaudy and big and it tastes good, but really just a bunch of overprocessed sugar. FUN FACT OF THE WEEK: My mother tells me that in the 1970s the rumor was that the backmasked voice at the beginning of "Fire on High" was the recording of a real man's last words before his execution. This totally isn't true, but it's one of those stories that's so good that I feel compelled to perpetuate it nonetheless. BEST SONG YOU'VE HEARD: "Do Ya"
BEST SONG YOU (PROBABLY) HAVEN'T HEARD: "Fire on High"